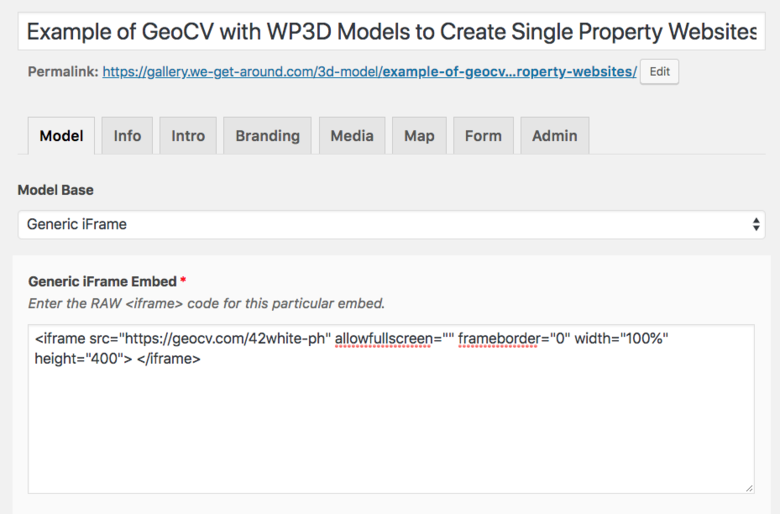 With the buzz about GeoCV Virtual Open House 3D Tours™, I could imagine that you are wondering if GeoCV can be used with essential Content Management System (CMS) tool WP3D Models WordPress Plugin to create Single Property Websites, Gallery (and leverage SEO powered by WP3D Models). Yes! It's super-easy and super-fast to pair GeoCV with WP3D Models. Here is the Branded, Skinned-view Single Property Website generated by WP3D Models WordPress Plugin using the GeoCV tour. 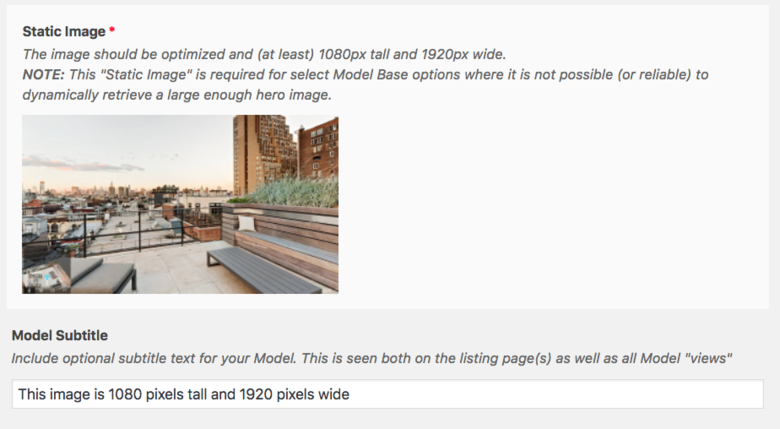 Questions about using GeoCV with WP3D Models? Thanks for this - totally completes the circle with this exciting new product. @DanSmigrod, there is no support for full screen on mobile? This is shortcoming of wp3d or mobile browser? It's the limitation of a mobile browser. In case of Matterport inside WP3D websites, when you click "Explore 3D Space" the 3D tour opens in the same tab, but also with the original link. So I wonder, do you see a problem of tour opening in a new tab, or a that original URL is visible? In our case, when you click "Play" in WP3D website, GeoCV 3D Tour loads in the same tab, with the WP3D URL, and at least on my iPhone the only thing that makes it not truly full screen is a thin black bar on the top from WP3D, which allows you to get back to the website. You can disable "Full screen" button in GeoCV Tour Editor. We also have some options to have white-labeled URLs. @Anton — the space does PLAY within the same page. The new tab open ONLY when I opt for full screen button. At first concern here is the source URL visibility as it does differ from clients’ brand name. Opening in new tab with client URL - should be still fine. Disabling the “full screen” option on mobile must be the way as it does not take you full screen anyway. On mobile, one can opt for desktop version of browser and get real full screen - but this often crashes. In any case, I was under the impression that WP3D is the solution designed to address such needs of 3D models. As majority users’ first and most access point being mobile I feel it has to be to addressed on priority. Everything is mobile first now. Also, on mobile the 2D & 3D floor plan view from the left bottom corner are disabled - perfectly fine for mobile phones but for tablets it should be availed. iPad is my primary gear for demo. I cannot imagine of being forced to take out laptop to showcase full feature sets. On second thought even mobile users (as said it is THE primary and most time available access mode for MOST) you could think of keeping it on (I switch to desktop version but as said it crashes). People are on 5.5” to 6” screen estate (May be below average but a lot of them) so an option to display the layout for navigation could still make sense and very very handy as it is very functional feature. Ross here from WP3D chiming in a bit. With re: to the functionality of GeoCV's (lower right) "fullscreen" arrows icon, this does appear to work differently between mobile and desktop users. Within WP3D, we do our best to maximize the viewing area for the "tour portion" of a page when the play button is tapped from inside the WP3D "skinned" view but these two functionalities are entirely separate from one another. In the case of GeoCV, the lower right "fullscreen" icon exists on both Mobile/Desktop and appears to behave differently depending on your device size. Smaller devices open a new tab as the "fullscreen" treatment, whereas desktop devices use the browser's built-in fullscreen option that doesn't actually open a new tab/window, but takes over all of your display's viewing area. Inside WP3D there isn't much we can do to change this behavior, other than suggesting that GeoCV customers reach out to their support about offering an option for disabling the fullscreen behavior (via URL parameter, perhaps?) on mobile devices. Such full screen behavior is the limitation of browsers on iOS. We decided to add an option for our customers to disable full screen button for such cases specifically. We'll add this functionality in one of the next releases of our Tour Editor and Viewer.